It is now widely accepted in the scientific community that climate change will lead to both incremental and rapid ecological change and disruption. The impacts of climate change, which include increased droughts, desertification, and sea-level rise, along with the more frequent occurrence of extreme weather events, will lead to a growing number of people displaced from their homes territories. 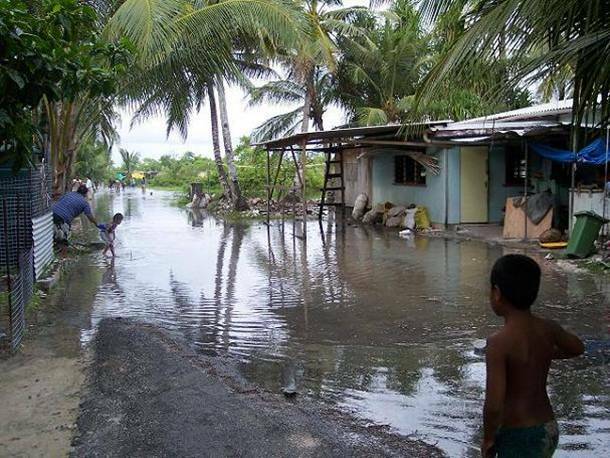 In the Pacific, climate change threatens food and water security of small island nations; infrastructure loss through coastal erosion and weather events; as well as contributing to increases in water and vector-borne disease with increased temperatures. Poignantly, climate change threatens the very existence of some nation-states, where sea levels rises are predicted to submerge atolls completely. Whilst climate change will impact all people across the world, people in the Pacific who will be among the hardest hit, have contributed least to the causes of this man-made problem. Pacific Islands collectively contribute only 0.37 per cent of global greenhouse gas emissions (0.01 per cent if Papua New Guinea is excluded). Friends of the Earth Brisbane is working with Pacific Island peoples to highlight the pending effects of climate change on our nearest neighbours. Tulele Peisa (“sailing the waves on our own”) is a local community organisation in Papua New Guinea that is trying to relocate the whole island community of the Carterets to nearby Bougainville because of the impacts of climate change. Friends of the Earth is supporting their efforts. Please donate to help support climate refugees. The Climate Frontlines collective, based in FoE Brisbane, has been leading FoE's work on climate change impacts on The Pacific and Torres Strait Islander communities. You can find out about the campaign here.